The wraps have finally been taken off the new Audi TT, and we’ve got all the details you need to know. 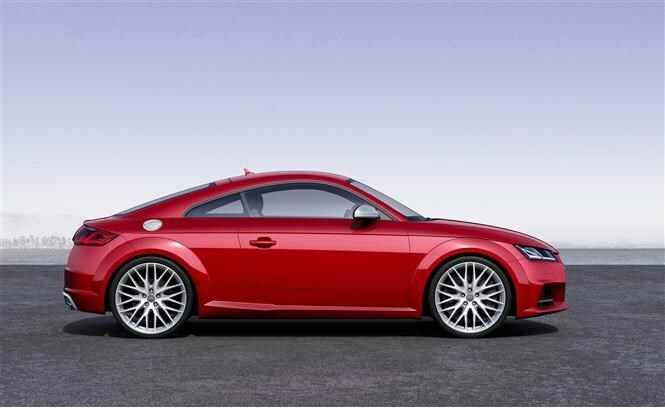 Since 1998 the TT has proven an undeniable hit with the UK’s car-buying public. The combination of distinctive, sporty looks and typical Audi build quality meant it appealed to many types of people, but its design hadn’t been updated since 2006 so it was getting a little long in the tooth. 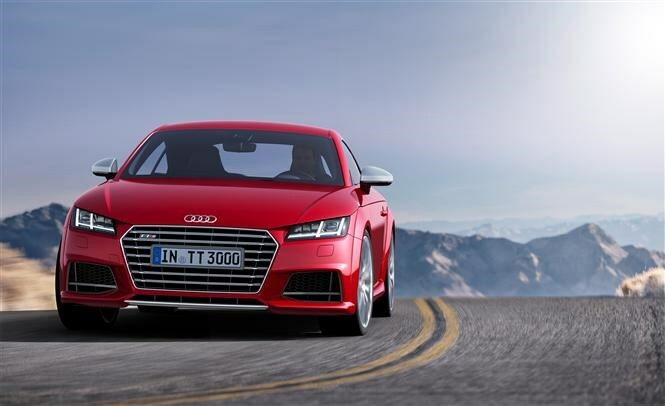 You can choose between three engines – one 2.0-litre diesel, a 2.0-litre turbocharged petrol and the high-performance Audi TT S which uses a more powerful version of the 2.0-litre petrol in order to deliver 306bhp and 380Nm of torque between 1,800 and 5,500rpm. That means for the TT S a sprint from 0-62mph is possible in 4.7 seconds, with top speed electronically limited to 155mph. You get a six-speed manual gearbox as standard, but an S tronic automatic is available additionally and comes with launch control, which provides optimum acceleration for the quickest possible getaway. The lower-powered petrol has 227bhp and 370Nm of torque, meaning 0-62mph takes six seconds flat and it has the same top speed as the TT S. Power is fed through a six-speed manual gearbox to the front wheels only. If you specify the six-speed S tronic automatic gearbox you also get Audi’s Quattro four-wheel drive system and quite a lot more speed. The 0-62mph sprint takes 5.3 seconds, yet fuel economy is a claimed 41.5mpg and CO2 emissions are 159g/km. For those after the lower running costs associated with diesel motoring, the 2.0-litre engine on offer boasts 182bhp and 380Nm of torque. A sprint from 0-62mph takes 7.2 seconds and top speed is 146mph, yet fuel economy is a claimed 67.2mpg and CO2 emissions are 110g/km, making this a decent choice even as a company car. Audi’s Drive Select system is installed and allows you to tweak the car’s performance and handling characteristics depending on whether you’re driving sportily, economically or normally. You can also tailor an Individual setting for the optimum configuration for you. While it may look like nothing much has changed, that isn’t the case at all. Standard-fit Xenon headlights are included, while Audi’s new Matrix LED technology – which diverts your headlights from other drivers’ eyes automatically – is an optional extra. Wheel sizes range from 17- to 20-inch diameter, while the new TT is the same height and length as the previous model. Its wheelbase has increased a little though, meaning shorter overhangs at the front and rear. 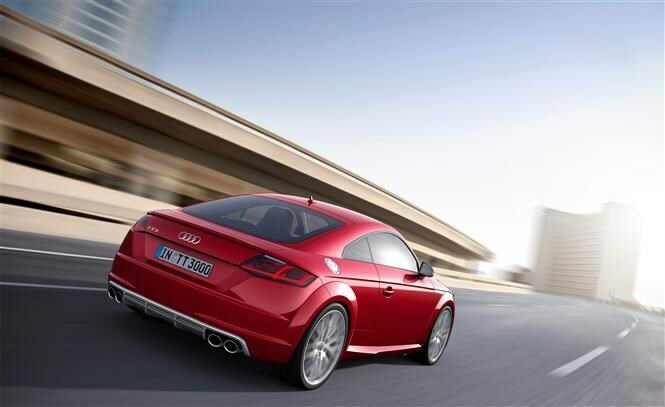 There’s a spoiler installed which automatically rises from the boot lid at speeds of over 74mph, while you get twin tailpipes on the diesel and lower-power petrol engines and four on the TT S.
Inside there have been more noticeable changes over the previous TT. Those classic round air vents are a nod to the car’s success in the past, but a new central digital instrument panel keeps things feeling modern. You get a new steering wheel with multimedia control buttons, while there are toggle switches on the dash for systems such as Audi Drive Control and hazard lights. Voice control for the sat-nav and multimedia system also features, as does an electronic parking brake. There’s also a plethora of optional extras to choose from to personalise your car to your tastes, including upgraded stereo kit and safety systems. We’re still waiting for Audi to give us a steer on UK pricing, but first deliveries are due to begin in late 2014. Parkers will be among the first to drive this all-new car. 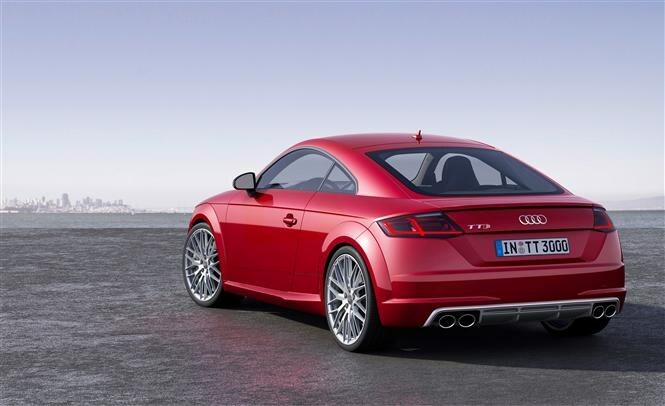 Check back soon for the full Audi TT review. 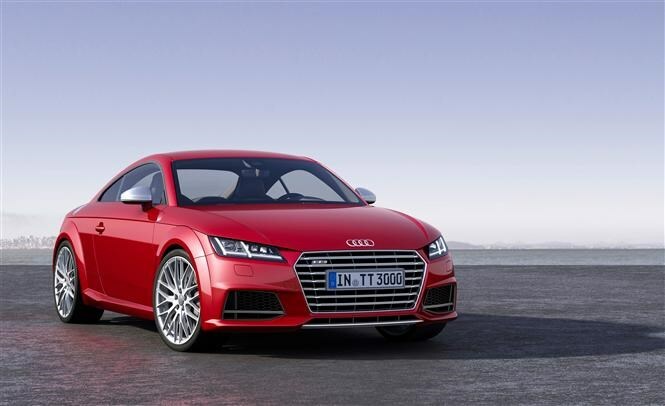 Click here for the current Audi TT and Audi TT S review.